Everything has gone as planned. You've bought a pair of baby pythons from a breeder and raised them for a couple of years. You've watched them grow, cared for them, cleaned them and touched things with your bare hands the likes of which your mother would not approve. You've fed, cooled, cycled and worried about them, and now you find your female coiled around a beautiful, white clutch of fertile eggs. You planned for this, and you are ready for the challenge ahead, right? Eggs have certain requirements, and once they are met, a good, viable egg will hatch. There are many ways to get from point A to point B, and the egg doesn't care how as long as it gets what it needs. Egg requirements fall mostly into two categories: temperature and humidity. And for most species of python eggs, the requirements are identical: a temperature of 90 degrees Fahrenheit combined with high humidity. Nearly every python egg has been hatched by the female that laid it. Female pythons are good mothers and have been programmed by millions of years of evolution to do one thing: make baby pythons! Female pythons of different species have varying control over both temperature and humidity. Burmese pythons contract their muscles in a rhythmic shivering or twitching to generate heat. Reticulated pythons, African rock pythons and others accomplish the same increase in body temperature without these visible contractions. In both cases the snake's body and the eggs themselves are maintained in a very narrow range of temperatures despite changes in the ambient temperature. Incubating female pythons are also able to influence moisture in the environment immediately around the eggs by behavioral means. The respiration of the eggs themselves generates some moisture. This moisture can be conserved if a female coils tightly around her eggs, or it can be allowed to escape if she opens her coils. Incubating female pythons are constantly monitoring temperature and moisture levels of their eggs and making adjustments throughout the incubation period. If the gravid female python is to be allowed to incubate her own eggs, then some preparations need to be made in advance on the part of the keeper. I like to provide a nestbox a few weeks before the eggs are due. It should be large enough to contain the coiled snake, but small enough that when the female is incubating her body can touch the sides. For small species (carpets, ringed pythons, Macklot's pythons and others of similar size) I provide a plastic Rubbermaid-type box with a hole in the side or top to allow the snake access. For larger species (Burmese, reticulated and African rock pythons) I construct a wooden box about 24 inches square, with 6-inch-tall sides and that is open on top. The floor of either type of nestbox should be covered with about 3 inches of slightly damp sphagnum moss. The moss should be damp enough so that it is not dusty, but only damp, not wet. Most pythons go through a shed cycle about 30 days before laying time. I usually provide the nestbox after this prelay shed. Most female pythons spend the majority of their time in the nestbox the month before laying. During this time they arrange the substrate to their liking. I've observed Burmese pythons preparing a nest area by pressing a bottom coil down on the substrate and rolling it to the outside, which creates a bowl-shaped depression. In the wooden nestboxes this movement eventually pushes all the moss from the bottom of the box and into the corners and sides. In the wild, I'm sure females are able to make deeper depressions with this process. That said, I've had females lay eggs on a flat newspaper-covered surface and hatch them with good results. The laying process itself takes several hours. Females of all species arrange themselves in loose coils with their tails in the center. Eggs are deposited in an ever-growing pyramid-shaped pile within these coils. After laying has been completed the female covers her eggs completely with her body. Sometimes in smaller species the eggs are so completely covered that it is possible to lift the female and her eggs from the nestbox and not be able to see the eggs — her body covers them top and bottom, and at no point do the eggs even contact the substrate! Should the eggs be incubated artificially or maternally? Most keepers incubate eggs in an incubator, but only, I think, because they are unfamiliar with the female snake's capability for incubation. If the eggs are to be left with the female, the temperature in the cage should be maintained in the low to mid-80s, with around 80-percent relative humidity. Those unfamiliar with maternal incubation are often reluctant to completely turn over the responsibility for the eggs to the female. There is a temptation to turn the entire cage into a big incubator by raising the temperature and humidity above the proper levels in order to "cover their bets." The female, however, only has the ability to raise the temperature of the eggs. She can't lower it. If the ambient temperature is already set at 90 degrees, then she no longer has any control over temperature. The female can either conserve or release the moisture generated by egg incubation. Likewise, if the ambient humidity is already at 100 percent, then the female python has no influence over that either. If a female snake is to incubate her own eggs, give her an environment in which she has some control. Remember that female pythons are perfectly suited to incubate their own eggs! For species that do not generate their own heat during incubation (e.g., spotteds, balls and carpets) I provide basking areas. In most cases the heat source for the enclosure will be warmer than the average cage temperature, and this can serve as a place for the female to warm herself. As ambient temperatures approach ideal incubation temperatures, females leave their eggs less often to bask and in some cases won't leave them at all. Females can be very shy when basking and often return immediately to their eggs if they sense any activity near their enclosures. In the last few days of incubation females loosen their coils and expose the eggs. As this happens, the temperature of the eggs drops to almost the ambient temperature. It's important to monitor the humidity in the cage during this time. The female remains loosely coiled around her clutch as the baby snakes begin to poke their heads through the slits they've cut in their eggs. In the wild, the newly hatched snakes would disperse quickly from the nest. In a captive situation this is not possible, of course. I have lost some babies at this point, as they can be accidentally crushed by the female. It's a good idea to remove the hatchling snakes as they appear, if possible. Remember, wild snakes do not incubate their eggs in a controlled environment. It's warmer during the day than it is at night. Sunny days are warmer than cloudy ones. Sometimes it rains, sometimes it rains at night. The extra bedroom where you keep your snakes is stable by comparison. Monitor the temperature and the humidity, try not to interfere too much, and your female will be successful. In order to incubate eggs artificially you'll need an incubator that meets the requirements of the eggs. Most reptile eggs, including python eggs, can't be hatched successfully in commercially available incubators designed for poultry. The requirements of an incubating python egg are simple, but the egg won't hatch if these requirements are not met. The incubator needs to provide an environment in which both temperature and humidity can be controlled at optimal levels. Hobbyists, for the most part, require an incubator that's able to hatch a clutch or two of eggs per season. Whether homemade or purchased, incubators should be made of material with some insulation value. Access should be through an opening on the side rather than the top. Because heat rises, incubators with access from the top lose heat quicker when opened. Incubators also should be wider rather than taller. Again, heat rises, so taller incubators result in greater temperature differentials from top to bottom. The incubator temperature is achieved and maintained by the interaction of the heat source and the thermostat. Heat can be provided by any of a number of means, including heat tape, a heat pad, light bulbs, etc. Controlling the temperature is critical, and it shouldn't vary more than a degree or so during incubation. Occasional fluctuations in temperature caused by opening the incubator are acceptable and do not seem to have a measurable effect on hatch rates. I like the fans used to cool desktop computers. They are small, quiet and fairly vibration free. It is not necessary for the fan to move much air. It doesn't have to be windy inside by any means. The slightest movement of air will break up temperature stratification and provide a uniform temperature throughout the incubator. Even so, I still like to have several thermometers in various locations to monitor the temperature, so I can confirm this at a glance. It's your responsibility for duplicating this environment in an incubator. To do this I place the eggs in smaller containers inside the incubator. It's easier to control the humidity in these containers than it is in the entire incubator. I use plastic containers manufactured by Rubbermaid, Sterilite or Iris. I place about 3 inches of damp vermiculite in each one, mixed equally with water by weight. Mixed in this way the vermiculite should be moist enough to clump together when squeezed, but not so much that it produces any water. Perlite mixed in similar proportions can be used successfully too for incubation. Many, if not all, of the eggs may adhere to each other. I'm sure this is helpful to a big female retic that must look after 60 or 70 tennis-ball-sized eggs for nearly three months. It's a bit inconvenient, however, when it comes to managing a 2-by-1-foot pile of eggs situated in an incubator. Eggs may be slowly and carefully peeled apart into smaller groups for incubation, but it is not necessary to separate each egg from the group. Some may be adhered at four or five points to other eggs. Others may not have contact with the substrate. This is the case with naturally incubated eggs too. Care should be taken to maintain the eggs in the same orientation in which they were deposited by the female, especially if more than a day or two have passed since they were laid. Place them gently into the smaller containers inside the incubator. Remember that each egg contains a living organism with its own oxygen requirement — so don't pack too many eggs into one container. I don't ventilate the smaller egg containers. Their loose-fitting lids and my occasional peek inside provide enough air exchange for successful incubation. The oxygen requirement increases as the eggs near hatching time. I remove the lid to look at the eggs more frequently at this time, which allows the eggs more air. 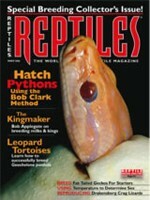 Python egg incubation is simple and straightforward. Remember, though: Just as some individual animals are stronger and more vigorous than others, so are embryos within eggs. If an egg or two doesn't hatch, it's probably not your fault. If more than that fail to hatch or if hatchlings show abnormalities in form or pattern, it may be necessary to examine your incubation technique. It really doesn't matter whether someone is a professional or an avid hobbyist, successfully hatching eggs is one of the most satisfying aspects of what we do.